Traveling up the elevator in the St. Louis Gateway Arch has a wonderful cadence to it. As the special round elevator pod travels up along the curve, you feel yourself leaning over and then just at the moment you might tip out of your seat, the pod self-corrects and you’re upright again… until the next ascent and correction. Libraries go through the same cycle. Their purpose evolves and their services, spaces, and staffing change organically and opportunistically over the years – providing a new service like data management, renovating a space like a learning commons, adding a department like user experience, consolidating a small departmental library, or co-locating a partner like a writing center. Then about every ten years or so, libraries need to look back, think ahead, and right themselves for the coming decade. The best way to do this is through a library master plan. Why Do Libraries Need Master Plans? Library master plans are needed now more than ever because of the variables, complexity, and pace of change. Libraries have changed from places to store and access information individually to places to connect, create, collaborate, curate, and convene. In response, campuses are looking to add study and instructional spaces, rebalance space allocations for physical collections on- and off-campus, co-locate or consolidate academic services, and renew existing buildings. Often libraries are spread across campus in different locations and managing the operations of distributed organizations and facilities is complex as institutions deal with growth, internal changes, and external pressures. What Does a Master Plans Enable You to Do? A good master plan considers services, spaces, and staffing together; analyzes the current state; forecasts the future needs; and develops practical strategies to get there. Done right, the process engages stakeholders across campus to create a comprehensive plan that provides short- and long-term improvements. Rather than something too prescriptive about what precisely needs to happen say 42 months from now (the kind of forecast you’ll get wrong by the way), you need to be able to assess upcoming opportunities, allocate resources, and flexibly implement the plan in a phased way that allows you to learn and innovate as you work toward your long-term goals. How Can You Create Your Library Master Plan? How can you create a flexible master plan to put your library on the right path? In our work with over 40 libraries, we’ve identified the key steps for library transformation: conducting research, establishing a vision, forecasting needs, creating new space/service/staffing concepts, updating service offerings and partners, rationalizing spaces and services within buildings and across the campus, identifying phases and pilots, and then redesigning the organization. Conducting research: To understand the current state and future opportunities, libraries need to look externally to peer institutions and other industries as well as look internally at the needs of their users and staff through interviews, observations, workshops, surveys, and data mining. When we worked with the University of Pittsburgh on the reinvention of Hillman Library, we identified trends like active learning applied to real-world problems, needs like faculty research mentoring through interviews and workshops, and guiding principles like the importance of designing for inclusion. Forecasting needs: Informed by research findings and guided by a vision, next libraries need to forecast their future needs in terms of space, service, collections, technology, and staffing – qualitatively and quantitatively. 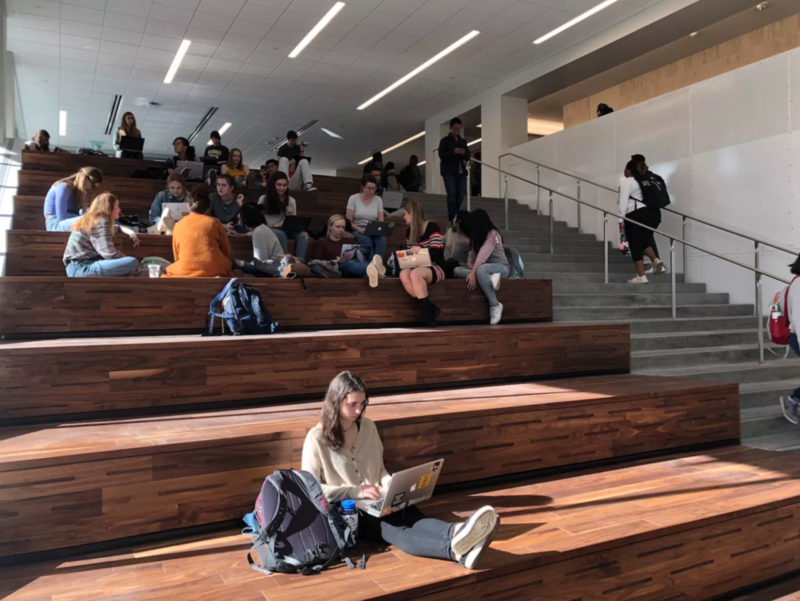 To create Emory University’s library master plan, we projected future user seating, staffing, and collections to get a sense of future space needs quantitatively while using qualitative input from interviews, workshops, and our survey to understand specific services and spaces needed. Creating a playbook of space/service/staffing concepts: With the needs identified and an overall forecast established to define the sandbox, you can then play inside it by brainstorming and building a wishlist of concepts to meet the needs, and then seek broad input from surveys and feedback fairs. For UC Davis’s library transformation, we created a playbook of these concepts – to be implemented based on feedback – including creating a peer research guide role, a research “Kickstarter” forum, and a data visualization hub. Updating service offerings and integrating partners: Based on the research findings, vision, needs, and concepts, libraries can then clarify and update their service offerings and identify academic or administrative service partners to work with to create a cohesive experience for students and faculty. To create a new learning commons at the University of Miami, we developed a service model with the different categories of services and activities for students (e.g., “work with data” and “collaborate and discuss”) which were then reflected online and in the space. Rationalizing the spaces and services across buildings: At the campus-scale, libraries need to get the right services, staff, and spaces in the right place and in the right amount. So they need to look at their locations and answer big questions about on-site vs. off-site collections, the role of smaller departmental libraries, and the focus of each location. In our work on the University of Wisconsin-Madison’s library master plan with Engberg Anderson Architects, we developed a strategy to consolidate 17 locations into 6 hubs that co-locate functions to provide a more effective and efficient experience. Rationalizing the spaces and services within buildings: At the building-scale, libraries must answer these same questions, but in greater detail. Rationalizing the number and type of service points (i.e., central and integrated vs. distributed and specialized) and creating a logical flow between spaces (i.e., moving from lively to quiet). For American University’s library master plan, we developed a plan to create a research commons that moved from 9 staffed service points to a concierge desk and an integrated service point. Identifying phases: Few master plans are implemented all at once. The reality – based on funding, maintaining current operations, and other changes that may be happening on campus – is that master plans need to be divided into phases of discrete projects that can be implemented over time, some dependent on others, some independent. For Carnegie Mellon, we identified the possibility for library expansion in the long-term while also identifying ways to sequentially transform existing spaces to better meet user needs, some of which are in this newsletter. Identifying pilot projects: Many master planning processes end with libraries being overwhelmed about the coming changes and not knowing how to get started. To avoid this and create a more flexible plan, libraries can identify space/services/staffing pilot projects whose results can inform the long-term strategy and build momentum. For the University of Michigan’s strategy for Hatcher-Shapiro library, we identified pilots such as a staff innovation lab called “The Hatchery” (get it! ), a consultation hub, and a citation management service. Redesigning the organization: When libraries transform their spaces and services, the way they organize their staff generally needs to change as well. Most library org charts are dated and organized around the selection, cataloging, and circulation of physical books with new functions like “digital scholarship” added on. Or they are confusing mashups of locations and functions. As part of Miami University’s library master plan we did with Perkins + Will, brightspot developed a new organizational structure that instead mapped departments to services. The use of libraries is changing rapidly and their purpose is evolving. New work patterns, new technologies, experiential learning projects, a new publishing reality, and interdisciplinary research projects are all changing library spaces, service, and staffing. So, libraries can’t stand still. And they haven’t been – they’ve been innovating along the way, to varying degrees. It’s only natural then to have to periodically step back, reflect, look ahead, and create a master plan for the future. While not every step is needed for each plan, libraries can transform by conducting research, establishing a vision, forecasting needs, creating new space/service/staffing concepts, updating service offerings and partners, rationalizing spaces and services within buildings and across the campus, identifying phases and pilots, and then redesigning the organization. Good luck as you move ahead and let us know if you need a partner on this path.